Looking for a reason to believe in the United Way? Spend a few minutes at the Community Table with our new Director of Development Daisy Rojas. As a former United Way client, Daisy speaks with a compelling first-person perspective. Daisy grew up in Albemarle County and graduated from Albemarle High School, then moved to Waynesboro, and worked for several years at the Waynesboro YMCA and American Express Financial Advisors. But circumstances changed, and Daisy returned to Charlottesville in 2000 without a job and without a home. She and her two children lived in a shelter for weeks. Several nonprofit partners of the United Way were there to lend a hand. Daisy enrolled her children in Albemarle County Bright Stars, a high-quality preschool program that partners with the United Way. She received counseling from CYFS (now Ready Kids), which has received program funding from the United Way. Some of her groceries came from the Blue Ridge Area Food Bank, which recruits many volunteers through the United Way. She felt supported by the community of Charlottesville and the programs and services that were necessary to help her start over. Over the next nine years, Daisy worked two jobs, got married, and had her third child. She returned to school at PVCC, started a business with her husband, and then went on to get two degrees from the University of Virginia. She’s glad to reconnect with the United Way. While in grad school, Daisy was chosen for a leadership seminar with President Emeritus John Casteen, a former United Way board member. She also conducted a research project about gift frequency within a multi-billion dollar campaign. Her mentor was Charly Fitzgerald, UVa’s Senior Vice President for Principal Relationship Development. Daisy has been involved professionally in fundraising and nonprofit development for many years. She served as Associate Director of Advancement at The Covenant School. 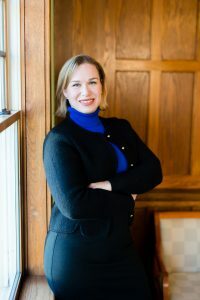 Prior to that, she worked at UVa in various positions for the Office of Development, the Darden School of Business, and the Curry School of Education. In 2013, Daisy and her husband Geiner Rojas won the Chuck Lewis Passion Award, an honor that goes to entrepreneurs who overcome adversity and contribute to the Charlottesville-area economy. As the United Way’s Director of Development, Daisy works closely with Presidents Circle donors. She’s looking to build community awareness and expand partnerships. The plan is to bring stakeholders together around the goals and ideals that underpin our One Community Table movement. Her role includes oversight of fundraising and communications strategies.